The sculpture’s absent arms and imaginary body aim at reflecting feelings of alienation and invisibility. 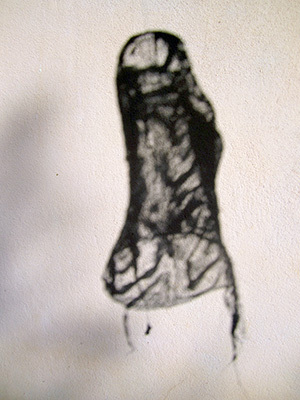 In her article “Writing the Body in Marlène Amar’s La Femme sans tête”, Susan Ireland writes about migrants whose “sense of cultural alienation is often expressed through the image of the body, which has emerged as a recurrent trope in their work” (p.454). Azouz Begag, an Algerian immigrant in France describes how “In La Femme sans tete, the parents’ invisibility stems from their desire to hide the exterior signs of their difference” (Amar 49 as cited on page 457). 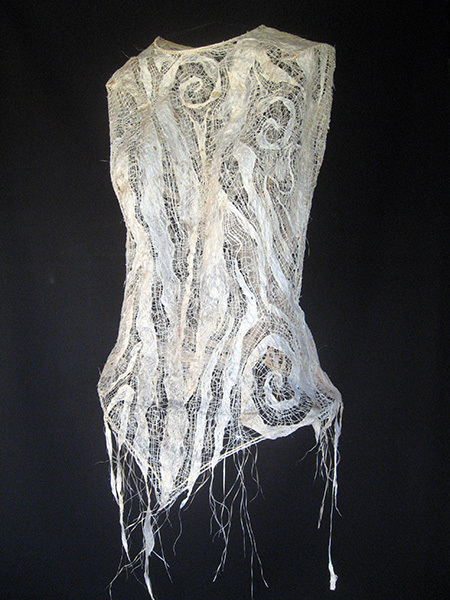 The breaking up of bark cloth and fibres (which serve as a symbol for community) is a pre-requisite for me to enable the merging of tapa with other materials such as kiriau (bark fibre) and thread to create an integrated new ‘hybrid’ shell inside whose womb-like protection I can feel at home without feeling totally excluded. Home has recently been included in Mary Schoesser’s fantastic book “Textiles – The Art of Mankind“. The work is still available for sale. For more information, please contact me.